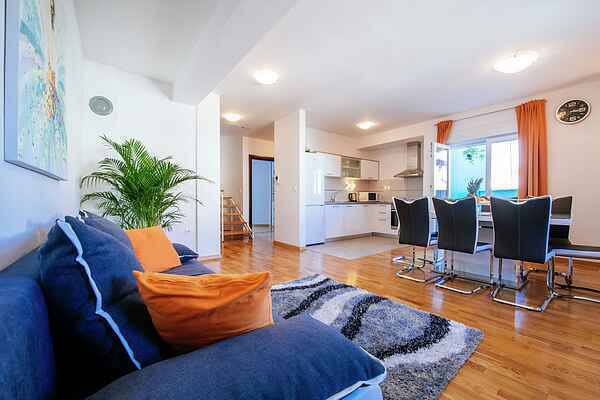 Orange rainbow apartment is a brend new accomodation located in a quiet residential area of Zadar. It's position provides its guests a peaceful vacation and in the same time it is close to the beaches, caffees, restaurants. Elegant spacious apartment is built up on 2 levels. On the lower floor there are cozy living/dining room, fully equipped kitchen, 1 bedroom and a modern bathroom. Upper floor offers 3 bedrooms and additional bathroom. All five rooms have an air condition device. Two bedrooms are connected with nice balcony. Apartment can accomodate up to eight people. There is a private garage on your disposal reachable through low entrance. Within the distance of 100 meters you will find a restaurant, grocery store and a public transport station. In the radius of 500 meters there are beaches, caffees, restaurants, tennis courts and wellness facilities of Falkensteiner hotel resort. Ancient town of Zadar is only 2 kilometers away reachable in 5 minutes drive or 10 minutes bus ride. There, you can feel end experience mediterranien atmosphere walking through narrow little streets typical for Dalmatia. You can walk on Roman Forum, visit numerous mediaeval churches or enjoy in famous sea orgs. Zadar is surrounded with 4 National parks, excursions to Kornati islands are organised on dayly basis. The most important climbing centre in Croatia Paklenica is only 45 km away. Such natural beauties classify Zadar to the top destination in Croatia.